As most people in the local area will know, Barnt Green is a wonderful place in which to browse a selection of independent shops, meet friends for lunch or a drink, and enjoy the traditional village atmosphere. Christmas is an especially good time to pay a visit, as Hewell Road can provide plenty of inspiration for festive gifts, stylish outfits and seasonal treats – and on December 13, selected shops along Hewell Road will stay open well into the evening, giving busy shoppers an additional opportunity to pick up all those Christmas necessities. As well as the welcoming lights in decorated windows casting a Christmassy glow over the street, some extra festive flavour will be provided by a group of local children who will entertain visitors by playing seasonal flute music outside Oasis florists. Shoppers who step inside Oasis will discover an array of flowers and plants for Christmas, from traditional wreaths and natural trimmings to seasonal arrangements, plus plants and bouquets to give as thoughtful presents and hostess gifts. There are also plenty of gifts on offer at the appropriately-named It’s A Gift, which provides lovely presents and cards to suit a range of family members and friends – including the four-legged variety. Meanwhile, if you’re looking out for a treat to make yourself feel gorgeous at Christmas or you’re shopping for a special lady, pop into Temptations, where you’ll find fabulous lingerie suitable for a variety of ages, sizes and budgets. The friendly staff will be happy to offer advice on the latest trends and help customers to choose underwear that fits perfectly. With the underwear sorted, check out Continental Collextion for beautiful occasion wear – this eclectic boutique stocks not only glamorous gowns but also sparkling accessories such as jewellery, shoes and bags. The men are not left out, with Style Council providing a wide choice of formal and casual menswear. As well as smart bow ties and cummerbunds for the party season, Style Council also offers excellent gifts for those hard-to-buy-for blokes, including wallets, luggage, grooming products and underwear. Finally, after all that shopping, why not relax at Cafe and Deli on the Green? Here you will find a vast selection of delicious food and drink to enjoy on the premises or to take away – and the deli section offers mouthwatering treats for foodies. 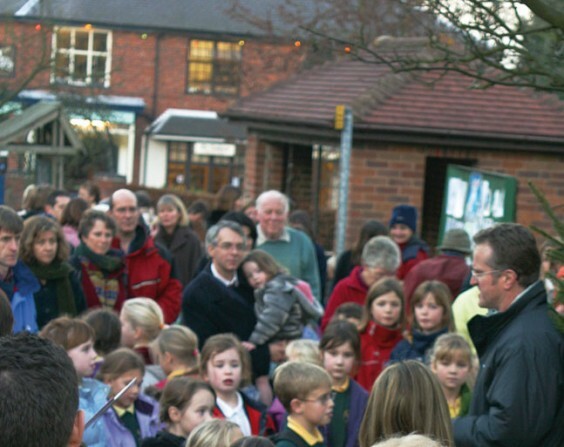 Above: The Rev Rob Fieldson, Vicar of Barnt Green, leads carol singing by the village Christmas tree in Hewell Road a couple of years ago.